Curaçao became a Dutch colony in the 17th century. In 1954, it gained self-government as an island territory of the Netherlands Antilles. Thirty years later, the Island Council inaugurated the national flag and the official anthem of the territory. Following the dissolution of the Netherlands Antilles in 2010, Curaçao became a country withing the Kingdom of the Netherlands. 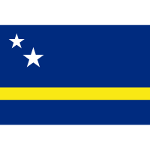 The flag of Curaçao is a blue field with a horizontal yellow stripe in the bottom part. In the canton, there are two white five-pointed stars. Blue stands for the sky and sea, yellow represents the sun, and the two stars symbolize two islands – Curaçao and Klein Curaçao. The national anthem of Curaçao, Himno di Kòrsou, was officially adopted in 1978. Its lyrics were written by Friar Radulphus, but later the government commissioned a group to rewrite them. The music was composed by Friar Candidus Nouwens. The national flag of Curaçao was adopted on June 2, 1984. The anniversary of this event is celebrated as a public holiday known as National Flag and Anthem Day.